The modular design of ULMATEC is unique on the market of industrial extraction technology. The construction kit offers more than 2.5 Mio product variations for almost any application. In addition to the various options as e.g. 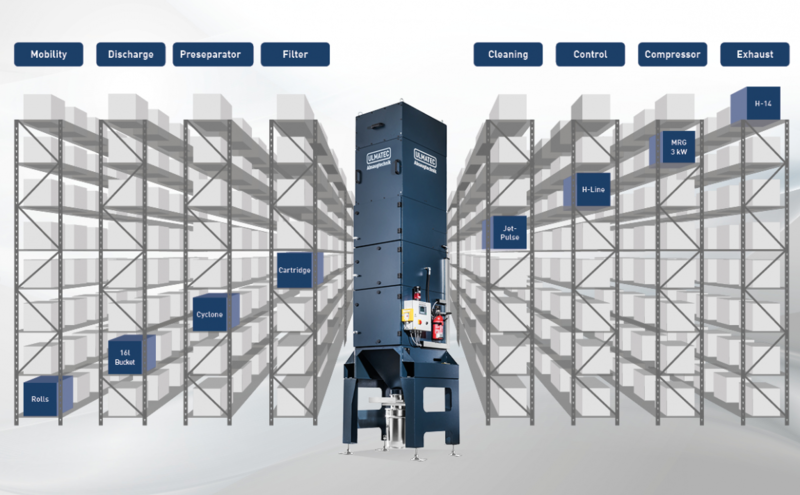 numerous discharge or filter variants, many more parts of our extraction units can be configurated customized. With standard devices, compromises often have to be made, for example in terms of engine performance, filter surface or discharge. Due to our modular system, each part of our extraction systems fulfills the optimum performance for your process and material. You do not only save costs and energy during operation, but also long-term expenses for spare and wear parts.